The Canon OPC1-P Outdoor Pendant-mount Clear Dome not only helps you protect your Canon VB-C10 or VB-C50i surveillance camera, but also allows you to deploy your camera outside. Designed for outdoor use, this dome housing lessens regular wear-and-tear and protects your camera from both moderately-inclement weather and intentional manipulation or vandalism. To add further security, the OPC1-P allows for sleek and tidy feed-through wiring for both the power supply cord and the Ethernet cable. 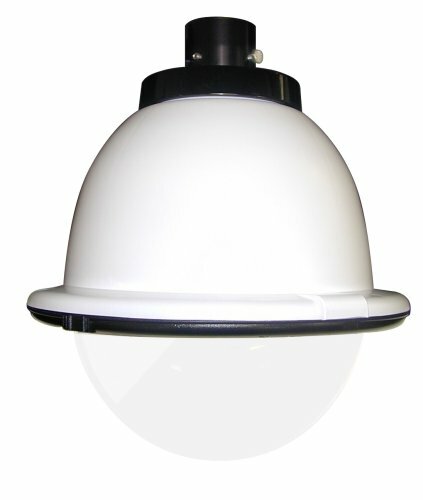 This outdoor dome housing is constructed of durable, UV-protected plastic that meets UL94V0 flame-resistance standards. Easy to install, the OPC1-P has a pendant-style mount with a 1.5-inch pipe thread. This unit also features a right-angle power plug and a 24-volt AC input for when you require longer-distance cable runs. Included in the OPC1-P are heater and blower units to maintain a good operating environment for the camera, which allows it to operate in temperatures ranging from -20 to 120-degrees Fahrenheit. This unit has a total electrical power capacity of 40 VA (Volt-Amperes), and includes a plug-in 110-volt AC to 24-volt AC wall transformer. The Canon OPC1-P is the easiest and most cost-effective way to protect compatible Canon surveillance cameras. The OPC1-P even includes a built-in power converter that provides 12-volt DC power to your camera, as well as all the necessary camera-mounting hardware. OPC1-P housing, mounting hardware, and 110-VAC to 24-VAC transformer.